Nearly all requests to Vault must be accompanied by an authentication token. This includes all API requests, as well as via the Vault CLI and other libraries. If you can securely get the first secret from an originator to a consumer, all subsequent secrets transmitted between this originator and consumer can be authenticated with the trust established by the successful distribution and user of that first secret. The applications running in a Kubernetes environment is no exception. Luckily, Vault provides Kubernetes auth method to authenticate the clients using a Kubernetes Service Account Token. However, the client is still responsible for managing the lifecycle of its Vault tokens. Therefore, the next challenge becomes how to manage the lifecycle of tokens in a standard way without having to write custom logic. The Secure Introduction of Vault Clients introduced three basic approaches: Platform Integration, Trusted Orchestrator, and Vault Agent. This guide demonstrates how Vault Agent works. NOTE: For the purpose of demonstration, this guide runs Minikube as a Kubernetes environment. If you wish to test against an Azure Kubernetes Service (AKS) cluster instead, follow the steps in the Azure Kubernetes Service Cluster section to create an AKS cluster. If you want to test against a Google Kubernetes Engine (GKE) cluster, refer to the steps described in the Google Kubernetes Engine Cluster section. Wait for a couple of minutes for the minikube environment to become fully available. In Kubernetes, a service account provides an identity for processes that run in a Pod so that the processes can contact the API server. Now, let's create a Kubernetes service account named vault-auth. To understand the steps, it is recommended to go through the following steps. However, you can simply execute the setup-k8s-auth.sh script and skip to Step 3 if you prefer to do so. Create a read-only policy, myapp-kv-ro in Vault. NOTE: This guide assumes that Key/Value version 1 secret engine is enabled at secret/. Create some secrets at the secret/myapp path for testing. Create a user to test the myapp-kv-ro policy using userpass auth method. # Create a user named "test-user"
Now, log back in with privileged token so that you can enable and configure an auth method. Set the environment variables to point to the running Minikube environment. Now, enable and configure the Kubernetes auth method. Create a Pod with a container running alpine:3.7 image. Once you are inside the container, install cURL and jq tools. 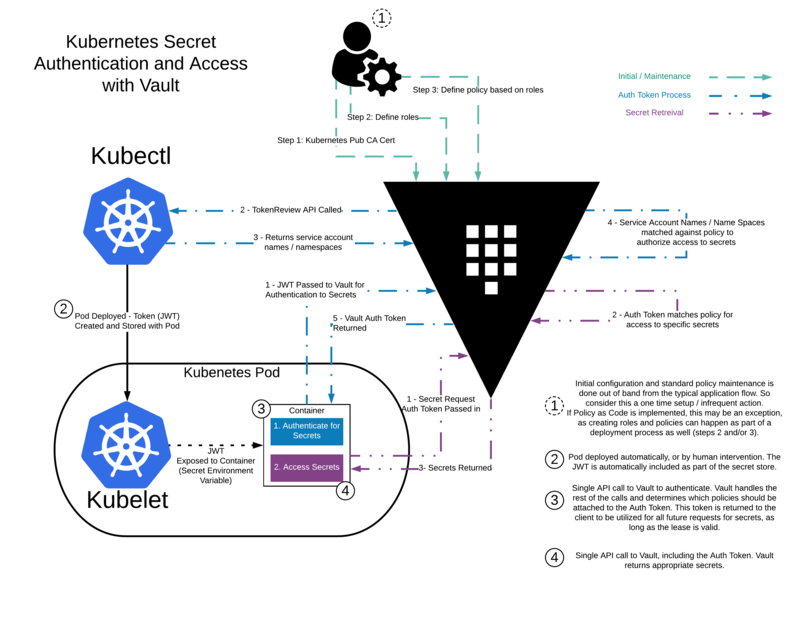 Set the VAULT_ADDR environment variable to point to the running Vault where you configured Kubernetes auth method, and test the connection. NOTE: Be sure to set VAULT_ADDR to where your Vault server is running if it's NOT running locally. Now, test the kubernetes auth method to ensure that you can authenticate with Vault. Notice that client_token is successfully generated and myapp-kv-ro policy is attached with the token. The metadata displays that its service account name (service_account_name) is vault-auth. Enter exit to terminate the shell session. 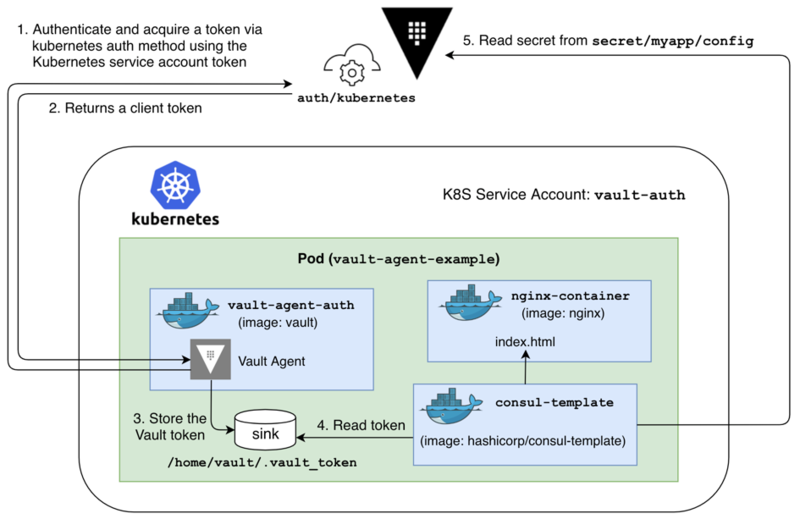 Now that you have verified that the Kubernetes auth method has been configured on the Vault server, it is time to spin up a client Pod which leverages Vault Agent to automatically authenticate with Vault and retrieve a client token. 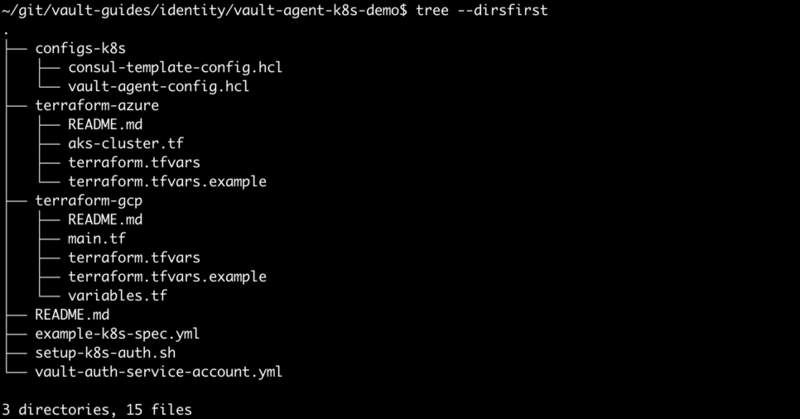 Review the provided Vault Agent configuration file, vault-agent-config.hcl which is located in the vault-guides/identity/vault-agent-k8s-demo/configs-k8s folder. 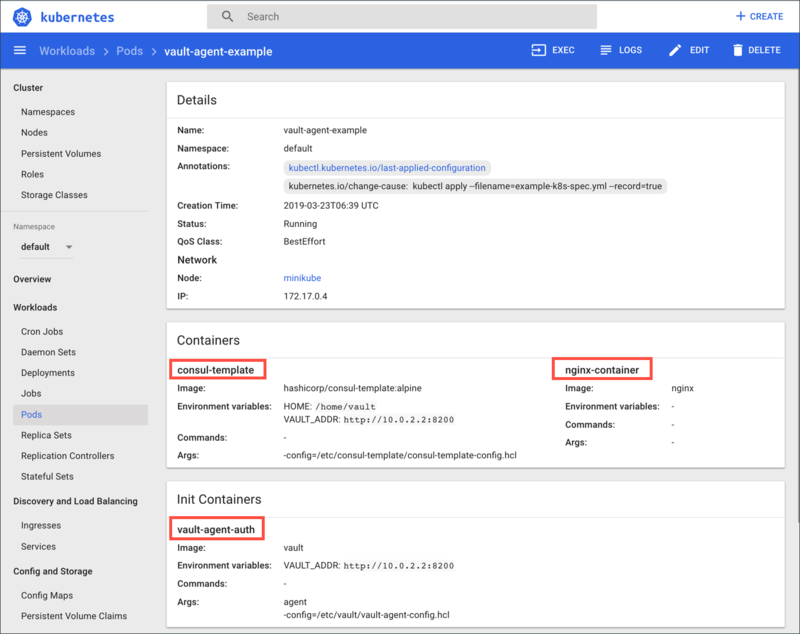 Notice that the Vault Agent Auto-Auth is configured to use the kubernetes auth method enabled at the auth/kubernetes path on the Vault server. The Vault Agent will use the example role to authenticate. The sink block specifies the location on disk where to write tokens. Vault Agent Auto-Auth sink can be configured multiple times if you want Vault Agent to place the token into multiple locations. In this example, the sink is set to /home/vault/.vault-token. NOTE: For the full details of Vault Agent configuration parameters, refer to the Vault Agent documentation. Now, review the Consul Template file, consul-template-config.hcl which is located in the vault-guides/identity/vault-agent-k8s-demo/configs-k8s folder. In Kubernetes, ConfigMaps allow you to decouple configuration artifacts from image content to keep containerized applications portable. Now, create a ConfigMap named, example-vault-agent-config pulling files from configs-k8s directory. NOTE: Set the VAULT_ADDR value to where your Vault server is running if it is NOT running locally (Line 43 and 74). This takes a minute or so for the Pod to become fully up and running. Click Pods under Workloads to verify that vault-agent-example Pod has been created successfully. Select vault-agent-example to see its details. Notice that the username and password values were successfully read from secret/myapp/config. Enter exit to terminate the shell. If you wish to test the Kubernetes auth method against an Azure Kubernetes Service (AKS) cluster instead of Minikube, you can run Terraform to provision an AKS cluster. Set your working directory to where the /identity/vault-agent-k8s-demo/terraform-azure folder is located. Modify terraform.tfvars.example and provide Azure credentials: client_id and client_secret, and save it as terraform.tfvars. NOTE: Copy the Kubernetes master address (https://education.hcp.westus2.azmk8s.io:443 in this example). In the /vault-agent-k8s-demo/setup-k8s-spec.sh file, replace Line 34 to point to the AKS cluster address rather than export K8S_HOST=$(minikube ip). Also, replace Line 40 to point to the correct host address. # vault write auth/kubernetes/config token_reviewer_jwt="$SA_JWT_TOKEN" kubernetes_host="https://$K8S_HOST:8443" kubernetes_ca_cert="$SA_CA_CRT"
vault write auth/kubernetes/config token_reviewer_jwt="$SA_JWT_TOKEN" kubernetes_host="$K8S_HOST" kubernetes_ca_cert="$SA_CA_CRT"
Resume Step 3 and on. Clicking on the View Kubernetes Dashboard in the Azure portal provides commands to launch Kubernetes dashboard. If you don't see this menu, follow the online documentation. You would need the resource group name and the AKS cluster name. Execute the following command and then try again. Set your working directory to where the /identity/vault-agent-k8s-demo/terraform-gcp folder is located. Modify terraform.tfvars.example and provide GCP credentials: account_file_path and project. NOTE: If you don't have the gcloud command line tool installed, follow the online documentation. Copy the Kubernetes master address (https://198.51.100.24 in this example). In the /vault-agent-k8s-demo/setup-k8s-spec.sh file, replace Line 34 to point to the GKE cluster address rather than export K8S_HOST=$(minikube ip). Also, replace Line 40 to point to the correct host address. NOTE: To learn about Vault Agent Caching, refer to the Vault Agent Caching guide.